Simulated Fluorescence Process (SFP) is the computing algorithm that is behind the Sfp Renderer and the Free Sfp. By modeling a physical light/matter interaction process an image is computed showing the data as it would have appeared in reality when viewed under these conditions. 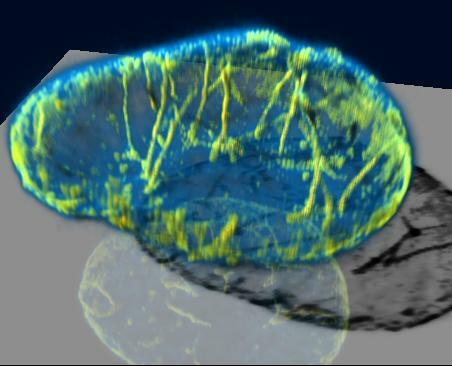 Tube-like intranuclear lamin structure traversing the nucleus of a living cell as visualized with green fluorescent protein (GFP). Data deconvolved with the Huygens Software and volume rendered with the SFP renderer of FluVR. Data Courtesy: Dr. J.Broers. A virtual light source produces excitation light that illuminates the object. This casts shadows either on parts of the object itself or on a table below it. The interaction between the excitation light and the object provokes the emission light, that also interacts with the object before it reaches the eye of the viewer. The VoXel values in the image are taken as the density of a fluorescent material. If the voxels are multiparameter ('Multi Channel' in microscopic parlance) each parameter is taken as a different fluorescent dye. Each dye has its specific excitation and emission wavelength with corresponding distinct absorption properties. The absorption properties can be controlled by the user. The different emission wavelength give each dye its specific color. To excite the fluorescent matter light with a given Excitation Wavelength must traverse other matter. The resulting attenuation of the excitation light will cause objects, which are hidden from the light source by other objects, to be weakly illuminated, if at all. The attenuation of the excitation light will be visible as shadows on other objects. To optimally use the depth perception cues generated by these shadows a homogeneous plane (the gray table) below the data volume is placed on which the cast shadows become clearly visible. After excitation the fluorescent matter will emit light at a different Emission Wavelength (longer than the Excitation Wavelength if the number of Excitation Photons is just one). Since this emitted light has changed WaveLength it is not capable to re-excite the same fluorescent matter: multiple scattering does not occur. Thus only the light emitted in the direction of the viewer, either directly or by way of the semi reflecting table is of importance. By simulating the propagation of the emitted light through the matter, the algorithm computes the final intensities of all wavelength (the spectrum) of the light reaching the viewpoint. Excitation: The transparency of the object for the excitation light. The less transparency the more shadow is casted on the subsequent voxels and on the table. Emission: The transparency of the object for the emission light. The lower the transparency for the emission light the more difficult it is to peer inside or trough the object. 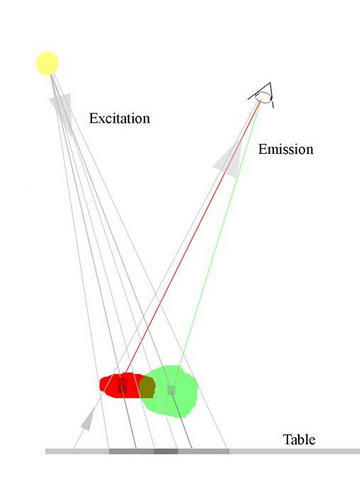 The Characteristic object size affects both the excitation and the emission transparency. While traveling through the object, the light intensity is attenuated to some degree. This enables us to define some definition for penetration depth at which the light intensity is decreased to some extent, say 10% of its initial value. This penetration depth should be in line with the object size. A transparent object is small with respect to the penetration depth. Thus for the same physical properties of the light one object can be transparent while the other is oblique due to its size. To find a reasonable range in transparencies the object size may be altered. At start-up the object size is computed from the microscopic sampling sizes and number of pixels the image is composed off. If your image has not the correct parameters (for example a tiff series) the object size is set according to the default parameters as set by the Huygens Essential software and may not be related to the actual object size. Material efficiency: The efficiency of the individual channels (here represented as materials) to interact with the incident light beam. See the Wikipedia for further references.